A feel good drama, Places In The Heart celebrates the human spirit through the simple story of a widow determined to thrive. Rural Texas in 1935, the depth of the Great Depression. Edna Spalding (Sally Field) is suddenly widowed when her police officer husband is accidentally shot and killed by a drunk, leaving her to care for their large farm and two young children. Edna receives moral support from her sister Margaret (Lindsay Crouse), who does not know that her husband Wayne (Ed Harris) is carrying on a passionate affair with married local woman Viola (Amy Madigan). 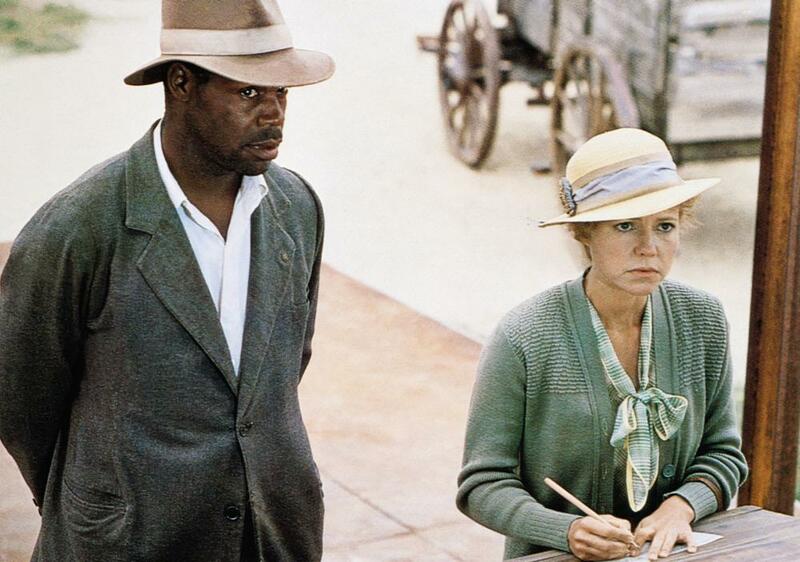 Threatened with foreclosure by banker Mr. Denby (Lane Smith), Edna accepts help from drifter Moses (Danny Glover), a black man who claims that he can create a revenue-generating cotton plantation on her farm. Edna also takes in the blind Mr. Will (John Malkovich) as a boarder to raise some money. Despite the price of cotton plummeting, enormous pressure to sell the farm, rampant community racism against Moses, and nature's fury, Edna pushes ahead, determined to not give up on her land or her family. Directed and written by Robert Benton, Places In The Heart is a slice of rural life, where the struggle for economic survival shatters class, race, and gender divides. The film may be a hopelessly optimistic parable in its portrayal of a woman in the 1930s staring down the depression, the bankers, the racists, physical disabilities and mother nature to turn her life around, but there is no denying the uplifting and well-intentioned energy coursing through Edna's story. With beautiful period sets and Néstor Almendros cinematography glorifying the landscape, the film plays with themes of trust and betrayal. Once her husband is killed Edna is forced to trust first Moses, a drifter and thief, and then Mr. Will, a blind man much more likely to be a hindrance than a help. They will need to prove their worth, and the film revels in contrasting Moses and Will's contributions to Edna's life with the individuals who should be her more natural allies: healthy white men in the form of the banker Mr. Denby and the cotton merchant W.E. Simmons (Jay Patterson). Benton's script includes a substantial subplot involving the illicit affair between Wayne and Viola, at the expense of Edna's sister Margaret. The story of a marriage under tremendous stress adds to the texture of the community and the themes of trust and betrayal, and Viola's fury at Wayne's continued affection for his wife contributes an uncommon cutting edge. But Edna's story of endurance never fully meshes with the turmoil in her sister's life, and the two plots occasionally trip over each other. Sally Field won her second Best Actress Academy Award for her portrayal of Edna, and its a solid enough performance, more robust than spectacular. 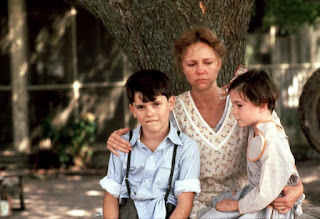 Field reaches an early highlight when Edna is forced to confront punishing her young son, a distasteful duty previously performed by her husband. Field captures the horror of a mother coming to terms with what it means to physically abuse a child, ticking off one more thing that will now change in her family's life. Wisely, Benton is capable of removing the rose coloured glasses when needed. While Edna's journey carries an eternally positive trajectory, the film avoids the temptation to neatly tie up all the loose ends. There are troubles aplenty scattered in the unforgiving southern landscape, and the only certainty is continued interaction between what is sincerely labelled good and evil. Places In The Heart ends with a beautifully mystical moment, an unlikely gathering where human judgement is deferred in favour of a greater communion. Breathing deeply from the complexities and mysteries of life, Places In The Heart emits a warm, soft glow.